womenforfootball- Copa America 2015’s breathtaking games came to an end last week with a great final touch by Chile in the Final. They held Copa America trophy for the first time in their history. Chile displayed superb games by beating top dogs such as Mexico, Uruguay and Peru all the way to the Final to stall and put an end to yet another Final heartbreak for Argentina. Watching their thrilling games I wondered if Chile’s impressive run of games in this Tournament is linked to their Youth team’s success? To be able to track their youth team’s progress throughout the years, I checked Chile’s track record in U-20 World Cup games. Their best record is their 3rd spot finish with their youth team at U-20 World Cup 2007 games. Few years later, they made it to Quarterfinals of U-20 World Cup 2013 games. From their 21-men squad in their 2007 team, fearlessly their manager featured 7 of those youth players in World Cup 2014 games. As everyone knows, Chile had a great run of games at World Cup 2014 games too, most known for their elimination of Spain at Group Stage. Then, in the recent Copa America games, 6 players of their squad came from the same strong U-20 team of 2007. So over 1/4th of their current Champion team is made up of their 2007 youth team. To put into perspective, Chile youth team’s progress is compared to their Final game’s opponent, Argentina. Argentina has a great young generation too, most notably World’s Best player, Lionel Messi’s quick progress from Argentina’s youth team to their main squad. 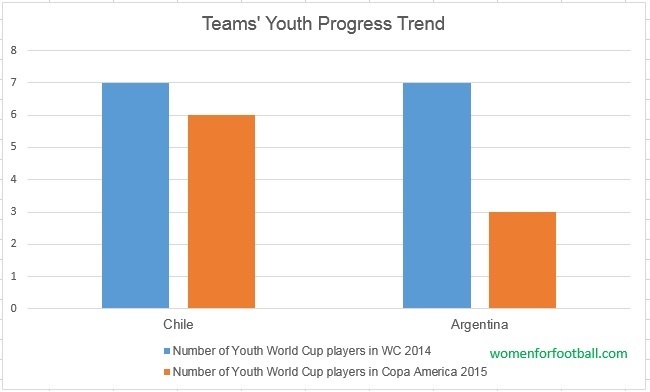 Yet, Argentina barely stack up against Chile’s youth progress. Back in U-20 World up 2007, Argentina youth team became the Champion of the Tournament. Out of that championship squad, 7 youth players were featured in 2014 World Cup games. As all football fans know, Argentina made it to the Final of 2014 World Cup games. But in recent Copa America games, which again Argentina made it to the Final, only 3 of the same youth players were in the squad. It may be too radical to base Chile’s recent championship on one factor only. Certainly, their players’ fitness and great performances at top clubs of Europe played its part as well. But based on data above, it could be said with great certainty that Chile’s investment in youth has paid off; most recently in Copa America 2015 but the trend could well continue in years to come.